Personal App: How-To – How can we help you? Creating a PersonalApp is exactly the same as creating any other program. There are only a few key differences which you will find on the Program page of your individual program. About mid-way down the Program page, there is the PersonalApp section. Check the box next to PersonalApp to activate the feature. Once PersonalApp has been activated, the timer for the application to be completed should be set. This is found under "Time Allowed for Application". The maximum amount of time that can be given to complete an application is 365 days, or a full year. The timer can be set down to a specific number of days, hours, and minutes. This timer will display to your applicants and will initiate countdown as soon as the application is started. The timer will continue to count down even while the applicant is logged out of their application. 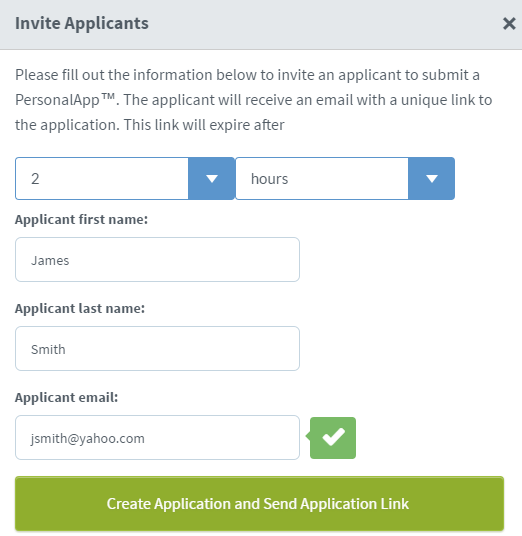 When you are ready to invite an applicant to our PersonalApp program, go to the Program page and click the "Invite Applicants" button. One applicant can be invited at a time. You will need the applicants first and last names as well as their email address. From here, you will also set the expiration date for the email invitation. This expiration period can be anywhere between 1 hour to 90 days. Once the invitation is sent out, you will see a confirmation message appear at the top of the invitation window and you will be able to then enter your next applicant. The applicant will receive an email like the one below. The applicant will click on the link (or copy & paste it in its entirety into their browser's address bar) and will be taken to the applicant view of the program page. If you would like to provide the applicants with instructions on this page, you can enter it on the Program page of your PersonalApp program in the "Description" and/or "Requirements" sections. The applicant will click the "Start Application" button and will then be prompted to sign into their existing account or create a new account. Once they've done this, they will be taken to the application and the timer will begin its countdown. The countdown timer will move with the applicant as they scroll through the application, but will remain out of the way and won't hinder their view of the questions. If the applicant has not yet submitted their application before the timer runs out, they will receive the following message. Their information entered up to this point will be saved and the application will automatically be submitted (showing a status of "Submitted" on the admin's end, too).